"It's like I'm out in a big boat and I see one fellow in a rowboat who's tired of rowing and wants a free ride, and another fellow who's drowning. Who would you expect me to rescue? Mr. Cedar, who just got tired of rowing and wants a free ride? Or those men out there who are drowning?" The public domain issues surrounding It's A Wonderful Life may have made that movie Frank Capra's best-known picture, and the director said on more than one occasion that it was his favorite. And though the Christmas season isn't complete without a visit from Clarence and company, I'm partial to Mr. Deeds Goes to Town, myself. It's a marvelous balance of sheer entertainment and hopeful social commentary; it was an enormous success at the time of its release, and has only improved with age. This was Capra's first picture after the astoundingly successful It Happened One Night, and in context it's easy to imagine the director's unease about selecting his next project—how do you follow up the first movie to win five major Oscars®, for best picture, director, actor, actress and screenplay? By letting just a dollop of social conscience creep in—that's how. Made at the nadir of the Depression, Mr. Deeds has the finely-crafted screwball elements of the director's previous movie, while providing a heartfelt commentary on the hardships endured by much of his audience. For the uninitiated: Gary Cooper plays Longfellow Deeds, who has never left the small town of Mandrake Falls, Vermont; he's content playing his tuba in the town band and writing doggerel for postcards. He improbably inherits $20 million when a rich New York relative dies in a car accident, and the country mouse is whisked to the big city. He's the talk of the town, but he isn't talking. To get to him, the New York Mail dispatches their ace reporter, Babe Bennett (Jean Arthur). She masquerades as a small-town girl, and Longfellow falls for her; they're out on the town at night, and she's ratting him out in the paper during the day. Of course, he's heartbroken when he finds out, and reaches a bigger conclusion: all that money is too much trouble. He sets about giving away his fortune to the indigent, to the many that need a boost more than he does. That scant summary hardly does justice to the picture, with its splendid screenplay by Robert Riskin. Riskin has an acid tongue when he needs it ("You've been making love to a double dose of cyanide! "), and most of his best barbs go to Lionel Stander, later of Hart to Hart. But the writer is charitable toward the Vermonters, too, and especially toward the unemployed, peppering the streets of New York. It's a script that also demands attention from lexicographers, as the words "doodler" and "pixelated" were coined here. It's always a little startling to see what a terrifically understated comedic actor Cooper can be—I always think of him first as Lou Gehrig, or as Sheriff Joe Kane in High Noon. But the sheer pleasure he takes in, say, sliding down a banister in his ritzy new house, is just delightful. This was also the movie that put Jean Arthur on the map—it sounds as if she was downright neurotic on the set, and had to be coaxed and cajoled in front of the camera; once she was finally there, she only wanted one side of her face shot. But she's a great foil for Cooper, and of course it's in the world of screwball that actresses of this age found their best roles. There are some things that you don't want to think about too hard—for instance, what are all these farmers doing in Manhattan? But that's poking holes, that's nitpicking at a classic motion picture. Mr. Deeds does have a significant legacy—for instance, it was a remake in which the Nick Nolte character was to star in the ill-fated I'll Do Anything. And if you haven't, you might want to see the original now, because a genuine remake is coming, starring Adam Sandler and Winona Ryder. Image Transfer Review: The disc was pressed from a print restored by the Library of Congress, but it's got a real Jekyll-and-Hyde quality. It seems to have been assembled from a variety of source prints, some of which have held up well over the decades, more of which look appalling. So the quality of the images vary from shot to shot—while much of it is clear, some of it is unaccountably grainy. It also bears the marks of its time, of course, with some especially unconvincing process shots—when, for instance, Deeds' train pulls out of town, Mandrake Falls might as well have been a painted background. The transfer is a reasonably good one; any distortion in the image seems to come from the source material. Audio Transfer Review: The mono soundtrack bears the mark of its time; some of the Slavko Vorkapich montages (the spinning newspapers, the alert trumpets, the startled faces) might have been overscored for modern audiences, and tend to sound a little tinny. And while the audio is not as uneven as the picture, it's still variable—many of the dialogue scenes are clean, but too many others are marred by hiss and a general muffled quality. 1 Feature/Episode commentary by Frank Capra, Jr.
Extras Review: There are "talent files" on Cooper, Arthur and Capra, as well as vintage advertising—i.e., eight original lobby cards. The main attraction, though, is a commentary track by Frank Capra, Jr., the director's son. He's articulate about and knowledgeable of his father's work, and it's pretty interesting to hear the pendulum swing between claiming credit for Dad and wanting to spread the wealth. There's praise for the actors, but a typical observation is, "His ability to direct Gary Cooper is marvelous in this scene." Note that it's Capra, and not Cooper, who is marvelous. Similarly, there's what might be called the Riskin problem—how much credit does Capra's screenwriter deserve for the director's most successful movies? Riskin, who was married to Fay Wray, was nauseated by all the talk of "the Capra touch." At the height of Capra's fame, Riskin was supposed to have dropped 150 blank pages—roughly the length of a screenplay—onto the director's desk, and said, "Now put the Capra touch on that." This commentary suggests that Riskin deserves credit for the dialogue, Capra for the story and the structure, but it's a contentious issue that's surely not going to be settled here, and not by an interested party like Frank Capra, Jr. The director's son is particularly good on situating the movie in Capra's career—after It Happened One Night, and in many ways the first of three interrelated movies, along with Mr. Smith Goes to Washington and Meet John Doe. And he's candid about Hollywood during the Depression—despite the nation's economic downturn, the movie business was making money hand over fist, and there had to be a lot of guilt that came along with all that cash. Mr. Deeds' dilemmas frequently must have been Mr. Capra's, too. Columbia, Harry Cohn's studio, still wasn't first tier at the time, and even a crowd scene could press the limits of a picture's budget—but Capra's artful shooting and handling of the boss smoothed things over. And forget for a moment about quality—the movie came in on time and on budget, and did big box office, which made Cohn happy and gave Capra the latitude he so desired for his next projects. Also included are trailers for three other Capra pictures—It Happened One Night, Lost Horizon, and Mr. Smith Goes to Washington, but curiously absent is a Mr. Deeds trailer. A featurette, Frank Capra, Jr. Remembers�Mr. 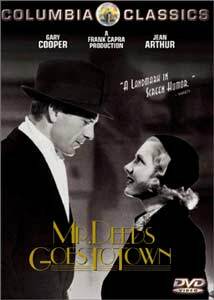 Deeds Goes to Town (11m: 11s) covers much of the same ground as the commentary track. Mr. Deeds may be a notch below Mr. Smith Goes to Washington or It's A Wonderful Life or It Happened One Night in Capra's career, but this is a handsome disc of a fine movie, that looks as good as it is ever likely to.